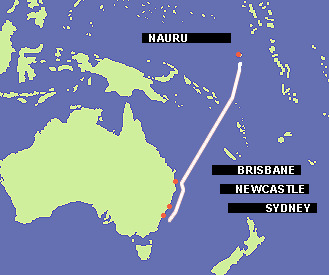 04.Jun.04 - There are currently boats travelling 4,000 kilometres to Australia's internment camp on Nauru. This is the most recent culmination of a series of protests against successive Australian governments' policies of interning undocumented migrants. The boats are presently at the halfway mark and, weather permitting, expected to reach Nauru by June 20. The crews have been threatened with imprisonment for crossing borders without the proper papers. It is well known that since 1989, successive Australian Governments have administered a notorious policy subsequently referred to the 'mandatory and non-reviewable detention' of all those who arrive by boat and without papers. This was a response to the (by international comparison) extremely small rise in undocumented boat arrivals after 1989 - many from the Middle East, Vietnam and Cambodia - whose internment was often successfully challenged through legal action. The post-1989 regime of border policing effectively and over time legislated that the refugee determination process exist outside the rule of law in the form of ministerial and administrative dictate and be discharged through concentration camps and military intervention. It is also well known that in 2002, protesters on both sides of the barbed wire scaled the fences at the Woomera internment camp in South Australia and a number of escapes occurred [more]. Woomera, which closed shortly after this, was emblematic of the Australian Government's strategy of interning undocumented migrants in remote, rural camps as a means of containment and control. Woomera was located 1,000 kilometres from the nearest capital city (Adelaide) and, for a time, held the largest number of detainees. 2002 was the culmination of four years of protests by detainees in Australia's internment camps, including hunger strikes, the destruction of buildings, and mass escapes. Many of those protests were met with tear gas, riot police and the use of chemical restraints. Following this, the Australian Government shifted its strategy toward a combination of 'dislocation' and electrification in an attempt to decompose the protests against the post-1989 regime of the camps. The so-called 'Pacific Solution' was introduced which established camps on Nauru and Papua New Guinea (Manus Island) funded by the Australian Government and managed by the International Organisation for Migration. Australian military vessels would forcibly remove undocumented boat arrivals from territorial waters and Australian islands, and transport them to those camps in the Pacific. The result of these changes to the architecture of the camps were immediate: the protesters outside Baxter in 2003 were unable to get close to or even within sight of any of those imprisoned there, many of whom had been relocated from Woomera [more]. Whereas Woomera2002 had managed to break with the symbolic character of protests by those outside the camps; Baxter2003 signalled the restoration of such, and subsequently ushered in a decline in the impetus of the movements against the camps. Having circulated as an audacious, but regarded as impractical, strategy after Woomera2002, the idea of shifting the protests against the camps to the northern waters of Australia became an imperative with the inauguration of the 'Pacific Solution.' After Baxter, Hopecaravan distributed a call for boats to travel to the internment camp on Nauru. That voyage is currently underway, with boats presently located at the halfway mark, and expecting to reach Nauru by June 20. The Nauru Government which - given its current fiscal woes and recent economic bankruptcy - relies on the continuing funding of the camp as a source of revenue and employment, has threatened to suspend maritime convention (the Law of the Sea) and forcibly seize the boats. They have also threatened to imprison the Flotilla crews as undocumented boat arrivals. This has not deterred the crews, who nevertheless require ongoing support and communication. Regular updates are available at flotilla2004.com, as are crew b-logs, instructions on sending text messages to the crews, and detailed background reports. The Australian Government, for its part, has adopted the pose of detached benevolence - an echo of its previous, farcical contention that it was not legally liable for the treatment and internment of those in the camps because they were outside Australian jurisdiction. Facing with an upcoming election, and as the Flotilla boats were cheered off from eastern coastal cities, the Government announced that under half of those detained on Nauru would be granted visas, and recently granted a visa to the remaining detainee, Aladdin Sisalem, on Manus Island [more]. These shifts follow a determined hunger strike last year on Nauru, after which the Government promised that it would review its rejection of the applications for asylum by those imprisoned on Nauru more]. The Government has, nevertheless, insisted that its camps in the Pacific will remain, at a cost of around $300, 000 per month. Previously, the Government had refused to grant visas to those taken hostage from the MV Tampa and forcibly transported to Nauru. At the time, the Government insisted that 'not one of those would set foot on Australian soil.' It is abundantly clear that the definition of who is a refugee and who is not (or: who is subject to the regime of the camps in order to classify people along this axis) is defined by what the Australian Government imagines to be politically advantageous at any given time. Those released from Nauru and PNG have expressed concern for the fate and safety of those who remain interned there. The voyage continues until the camps are closed. Angela Mitropoulos, Melbourne, June 3, 2004.